Description: These Acrylic Tumblers with a sturdy straw are perfect for a summer beverage. Keeps your drink cold without the drippy sweating of a regular cup. 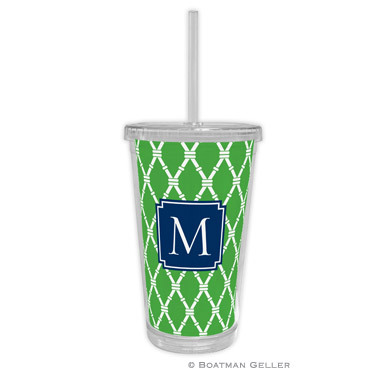 And choose a cute design and personalize it with a monogram or name! Cute, Cute, Cute! Inset can be personalized with your favorite colors and font choices. The design color can be changed and the inside can be a white inset, or any of the colors, with the monogram or name in a similar or coordinating color. Completely Custom! (color options for both the design and the inset and monogram or font choices are: jungle, raspberry, navy, cornflower, cherry, midnight, teal, sunflower, kelly, mocha, petal, lime, chocolate, tangerine, pine, slate, cranberry, butter lilac, plum, melon, gray, turquoise or bubblegum).